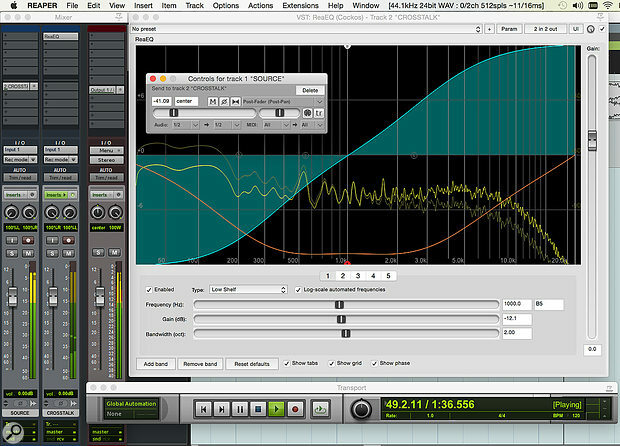 Simulating, in Reaper, the crosstalk that results from capacitive coupling in analogue audio electronics. Note that the channels are reversed on the Crosstalk bus, and that the EQ changes both the frequency and phase of the signal. I think I understand what crosstalk is, but I don‘t know how it sounds. I can’t find a proper explanation of how mixes sound with and without it, but a lot of people discuss the phenomenon on forums, saying that this or that plug-in sounds so sweet because of it having crosstalk... I don’t understand it, and a lot of people that talk on this subject often say other things that make my eyebrows furrow! Is crosstalk in plug-ins something to look out for, or is it a myth? SOS Technical Editor Hugh Robjohns replies: Crosstalk is something most audio designers have striven to minimise and avoid for over a century! It is the unintentional and (usually) unwanted ‘bleeding’ of sound from one channel into another, and it is an inevitable and inherent issue in analogue systems. In analogue systems, crosstalk almost always gets worse as the frequency rises, because it generally manifests as a capacitive coupling — so crosstalk normally sounds like a thin and tinny low-level bleed of whatever is on the other channel(s). Clearly, if you’re multi-tracking something you don’t want crosstalk from one channel to interfere with the other. Crosstalk can be minimised (and often reduced well below audible levels) by careful PCB layouts, grounding and good wiring arrangements, with balanced wiring being much less prone than unbalanced, for example. However, there are some beneficial aspects to crosstalk in certain circumstances. Most notably, when working with a stereo mix, crosstalk can affect the stereo image and width. If the crosstalk is in phase it will tend to reduce the image width, but if it’s out of phase it will tend to widen it. Sometimes that can be helpful, especially as it tends to be a frequency-conscious effect, generally getting stronger at higher frequencies. There’s no accidental crosstalk within a digital system, and it has to be deliberately coded in if required. SOS Reviews Editor Matt Houghton adds: In addition to what Hugh says, if you wish to satisfy your own curiosity about the sonic effects of crosstalk, you can simulate the process quite easily in your DAW — and can even tweak it for creative effect. For example, start with a stereo source (a mixed track, say, or a drum loop). Set up a send from your stereo source to a new stereo bus on which you’ve reversed the stereo panning, so that the source’s left channel is sent to the right channel of this bus, and the right to the left. Keep the bus’s fader at unity gain, and slowly increase the send amount from the source, so that its left and right channels start contributing to the bus’s right and left channels, respectively: you’re introducing crosstalk. (When comparing the untreated source with the ‘crosstalk-enhanced’ version, the latter will be slightly louder, which can skew your perception of which sounds ‘best’). For a more detailed imitation of the capacitive-coupling crosstalk effect that Hugh describes, keep the send level quite low, and apply some EQ to simulate the way this emphasises higher frequencies — a combination of high-shelving and low-shelving boosts (ie. a ‘tilt’ EQ) should give you the general idea. Choose a minimum-phase rather than linear-phase EQ, as this will also introduce some phase rotation that the capacitive coupling typically introduces. For authenticity, you’re looking for 6dB per octave shelves, but for creative effect, you can do as you please. This will get you into the right ball park... though it’s worth pointing out that in the real world of analogue electronics the crosstalk might enter the signal path at more than one point, and could affect unrelated sources on adjacent channels. A decent console will have been designed to avoid crosstalk in the internal signal path as far as possible, making the insert points and cables to patchbays more likely places for significant capacitive coupling to occur than the mixer’s own channel strips.